Added by Indo American News on July 31, 2014. SUGAR LAND: After bringing Bollywood’s biggest star, Farhan Akhtar to Houston for a good cause resulting in the biggest desi rock concert that Houston has ever seen, it is obvious that Magic Bus Houston’s next event is awaited eagerly. 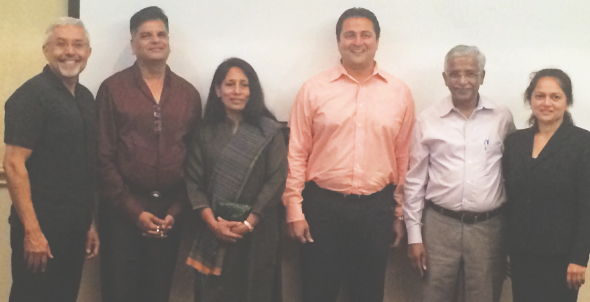 The Magic Bus board met on Tuesday, July 22 at Madras Pavilion in Sugar Land. Members of the media were invited to the event to get involved in an interactive discussion with the board members about the upcoming Gala. The Gala is scheduled on October 11, reception at 6.30 PM and proceedings begin by 7.00 PM at J. W. Marriot, 5150 Westheimer, Houston, TX 77056, on the second floor. The board meeting got under way when Amit Bhandari, President of Magic Bus Houston, welcomed everyone and spoke about the upcoming Gala. He spoke first about the organization itself. Magic Bus (magicbus.org) is a non-profit organization based in Mumbai with over 8000 volunteers and operations in fourteen states in India that impact over 250,000 children. The organization’s goals are simple – to change the course of children’s lives, one game at a time. Specifically, Magic Bus uses a unique, activity-based methodology to teach children about education, gender equality, health, and social issues by engaging them in games that reinforce positivity. Girls who participate in the Magic Bus program are much more likely to finish school and go on to higher education or get a job. Magic Bus USA’s Leadership Team is only a part of the global Magic Bus team, a distinguished collection of philanthropists, entrepreneurs, executives, athletes, and celebrities who share one common characteristic – a strong belief in the power of the Magic Bus approach. Amit also outlined some of the features of the gala including the announcement of Ram Shriram, venture capitalistic and Google board member as the keynote speaker for the Gala. Shriram, the first Google investor is a board member of both the US chapter and the International chapter of Magic Bus. He is a very generous supporter and for him to agree to deliver the keynote address is very encouraging for the Houston chapter. Kevin Negandhi will be the master of ceremonies at the Houston Gala. Kevin is ESPN sports anchor who hails from Houston and has an avid following in the younger generations of South Asians. Amit mentioned that the entire Houston board was very thankful to Kevin for agreeing to emcee the gala since Kevins’s involvements with sports matches Magic Bus’s vision as a supporter of sports and using sports as a medium for mentoring and getting out of poverty. Nearly 400 people are expected to join the gala. Amit Bhandari along with the entire Magic Bus Houston board is requesting support from the entire community with a goal to hosting a successful event and raise as much money as possible to support the noble cause. In conclusion, Amit Bhandari asked the board members to introduce themselves and their activities. Amit Bhandari, president of Magic Bus USA, moved to Houston about 7 years ago. He is a chemical engineer who turned into a businessman dealing in commodity trading about seven years ago. He became a member of Magic Bus USA and Magic Bus International board in 2013. Arpita Bhandari ably supports her husband in the Magic Bus endeavor. Arpita expressed that though they are attached to different charities, Magic bus touched her in a different way. She informed the media that Magic Bus is a 10 yearlong program for a child, starting from the age of 8 or 9. It not only teaches hygiene, gender equality, education, but also incorporates all the things in real life scenario. And this is what she loved about it and mentioned that all her 3 children have attended Magic Bus camps. Their oldest daughter Aanya Bhandari was present and happily shared her experience about Magic Bus slums that she visited in Mumbai. Dr. H.D. Patel, has lived in the USA for over 25 years and has been involved in various levels with the Indian Doctor’s Association, has been part of many charities and is happy to be a part of Magic Bus. Brij Kathuria, has been residing in Houston for over 30 years. Brij was executive at HP/Compaq for many years and currently very active in Indo-American non-profit organizations. He is the backbone of the planning and execution of the upcoming gala. Dr. Sunita Moonat, is a practicing gynecologist who is also a past president of the Indian Doctor’s Association, and spearheaded the development of this association’s Charity Clinic that has been serving thousands of people without health insurance in Houston for the past 10 years. She said that knowing Amit, she was confident about the money being utilized in the right way in Magic Bus so it was the main reason for her to join and support it. Swatantra Jain, partner at the trading company, Vinmar International has also been a part of Pratham as a past president and is on their national board. He is also the CFO of Pratham USA. Actively involved with JVB Preksha meditation center, he is happy to be a part of all these non-profits as they support people. Jugal Malani, CEO at Unique Industrial Product Company has been involved with various non-profit organizations in the Houston Area. He is the current President of India House, Houston. Amit and Arpita introduced him to magic bus, and he believes it is a very good cause and therefore, is supporting the organization. Gopal V. Savjani, (who was unable to attend the meeting) is an entrepreneur and the former owner of Diagnostic Systems Labs and is currently involved in medical research. He is a well-respected philanthropist and contributes to scholarship funds. After the board members were introduced, Amit informed the audience about additional Magic Bus activities in India and worldwide, including exciting news that actor Amir Khan will be doing a Magic Bus special on his popular TV show Satyamev Jayate . Another encouraging note is that the Department of State in US is supporting the Global circle of giving, within which a young professional from US will mentor a young girl in India. The idea is to pick a child at the age of 8 or 9 and mentor them till they are 18 and the US government will set aside money for each mentoring session. And when the girl reaches 18 and goes to college, this money will be released to pay for college in India. This program will also include involving professionals from Microsoft. Celebrities like actress and fashion designer Georgina Chapman, has committed $250,000 to Magic Bus. Magic Bus is also supported by Bollywood movie stars like Abhishek Bachchan, Aishwarya Rai Bachchan, Farhan Akhtar, Ranbir Kapoor, Dino Morea, John Abraham, Frieda Pinto. They have a Bollywood soccer team that plays friendly matches to raise money. Other Magic Bus supports include web retailer Amazon.com with 0.5% of your eligible AmazonSmile purchases being donated to Magic Bus USA. Nike has been supporting training programs for Magic Bus’ field delivery and staff across India since 2010. The board meeting ended with a question- answer session followed by a Guajarati style vegetarian dinner. Come support this great cause in their upcoming Gala on October 11, 6.30 PM at J. W. Marriot.